Anti-clockwise (from top left): Ship carrying Baba Makhan Shah Lobana caught in a storm, Baba Makhan Shah offers five mohars to a person posing as guru at Baba Bakala; Baba Makhan Shah in conversation with the ninth guru, Guru Tegh Bahadur,and Baba Makhan Shah announces the discovery of Guru Tegh Bahadur from rooftops. 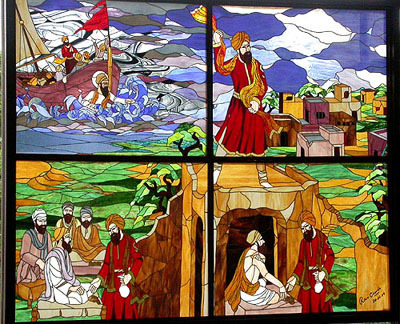 For the first time in India, an important episode of Sikh history has been captured on imported Italian stained glass which has been installed at the Makhan Shah Lobana Centre in Sector 30-A, Chandigarh, thanks to a talented local artist, Ms Ravi Chawla. The exquisite art work was formally unveiled today by Sant Baba Puran Singh, patron of the centre, at a simple ceremony held at the sprawling Lobana complex. The stunningly colourful creation uses 60 different types of coloured glass and more than 2000 glass pieces imported from Italy. It took Ravi nearly 10 months to complete her work at a cost of about Rs 1 lakh. "It is a complete episode which I have reduced to four drawings of 6 feet by 8 feet", said Ravi in a talk with TNS. Use of stained glasses has been fairly common in important buildings in Europe, she says. But it is the first time that something like this has been attempted in India. And the result has been heartwarming. Ravi says that obtaining the right type of glass she wanted and matching the colours posed a big problem. But she is happy that she has been able to complete her work. She says that she has also painted an episode from the Mahabharata which is currently displayed in the reception hall of the Haryana Civil Secretariat building but that is not a true stained glass. She has also done glass work in former Prime Minister Atal Bihari Vajpayee's house in Manali and the embassy of the USA and the British High Commission in New Delhi. Explaining the historical significance of the art work, Baba Puran Singh says that the Lobana community has produced many a great man who find prominent place in Sikh history. Lobanas were attracted by the high ideals of the Sikh Gurus and were drawn to the centrestage in the service of the Gurus right from the beginning. Baba Makhan Shah Lobana was born on July 7, 1619, at village Tanda in Jhelum district of West Punjab. He rose to become a big businessman who carried out his trade through land and sea coast but moved mainly through river routes. One day, one of his ships carrying his goods was caught in a storm and struck underwater rocks. His life, the safety of the crew and goods were in great danger. He knelt down and prayed to the Guru to help him, his crew and consignment to safety and he would donate five hundred mohars to the Guru's inventory for charitable purposes. The ship steered safely out of the storm. Makhan Shah immediately left for Delhi to fulfill his vow. On arrival in Delhi, he found that Guru Har Kishanji had passed away. While breathing his last, he had said "Baba Bakale". The ninth Master was to reveal himself at Bakala. He immediately moved his caravan to Bakala. He reached there in the first week of August 1664. On arrival there, he found that as many as 22 persons were posing as the ninth Guru. He saw that it was difficult to identify the real Guru whom he should offer 500 mohars. He decided to offer only five mohars to each one of them and gauge their reaction. The true Guru will be the one who shall known his secret wish. One by one he visited all of them and offered five mohars each. None reacted. Finally, he enquired if there was any other Sodhi Baba. On August 10, 1664, he was guided by a local boy to Guru Tegh Bahadur, popularly called Baba Tegha, where he was meditating. Makhan Shah bowed before him and offered five mohars. Baba then opened his eyes and said: "God bless you my man, but why only five mohars after having pledged five hundred". Makhan Shah was so overwhelmed by this chance discovery of the Guru that he was unable to speak for some time. He came out of the Guruji's room and climbed on to the roof. He waived his chadar over his head and started shouted; "Guru Ladho Re! Guru Ladho Re!" (I have found the guru! I have found the guru!). The announcement was greeted by thousands of people who had gathered there. Makhan Shah asked his attendants to bring all the gifts respectfully to the Guru's house while he himself carried a robe of honour, specially prepared for the Guru. On an appeal by Makhan Shah, the Guru then came out of his house and blessed the gathering.